I started my career working at George Lucas’s game division Lucas Arts when Episode 1 was in full production. By the time Episode 2 started, I had made my way into the film division. I did a large amount of work on Episode 2 and some development for Episode 3. I was fortunate to design and animate some really cool moments in Episode 2. The Nexu cat creature was my main focus for many many months. This shot I designed and animated below went through many, many revisions and much scrutiny. There are obvious issues with it, but ultimately I think it’s a cool shot. 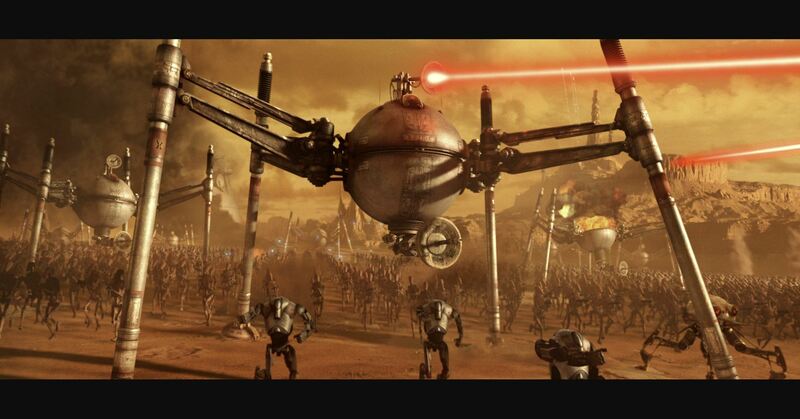 For the ground battle, I was tasked with developing the Hailfire Droids. I wanted them to be more dynamic and be drifting through the battle tearing stuff up but Goerge’s vision was to keep them very “rigid” with a calculated approach. One thing that I was able to retain was what I called “manga missiles” – inspired from classic 80s anime cartoons where the missiles arc around and do all these cool movements before locking onto and taking out targets. One of the cool things about being apart of a movie is creating stories, characters, and worlds that people will hopefully remember for a long time. There are two sides to that coin, however. How about being apart of one of the most hated characters in cinema history? I had that privilege when I was tasked with animated several shots of none other then JarJar Binks. The funny part was I really enjoyed animating his shots and took pride in them. Another droid I had the pleasure of developing was the Spider Droid. This big hulking robot just walks around like a boss and fires lasers at opposing targets. Capturing the weight and scale was important. I did some fancier tests involving them crabbing around and moving in a more threatening way but ultimately this more straight forward “robotic” approach was settled upon. These guys were only featured in one hero shot below, animated by Andrew “Spanky” Grant I believe.